In a series of tweets Sunday morning, Trump pledged to lower corporate taxes across the board. But he also said he would charge a hefty 35% tax for "any business that leaves our country for another country, fires its employees, [or] builds a new factory or plant in the other country, and ... sell[s] its product back into the U.S."
Trump argued that those companies deserve "retribution." He said businesses that want to offshore jobs have been "forewarned." It's a carrot-and-stick promise that Trump has made before. But after scoring a big political victory with Carrier, the debate about how -- and whether -- politicians should stop U.S. companies from shifting operations across the border has kicked into high gear. Many economists and investors are optimistic about Trump's plan to focus on the "carrot" part: the potential for big tax cuts and a roll back in regulations on businesses. Businesses have for years been urging Washington to lower its 35% corporate tax rate. Trump wants to make that rate 15%. He has also pledged to reduce regulations on several industries, most notably Wall Street and coal power. Related: Trump: Companies will be punished for leaving U.S.
On the other hand, some economists have expressed concern about the "stick": Trump's protectionist trade policies, which could hurt economic growth. Many of the opponents of the 35% tax include conservatives, who argue that Trump is picking winners and losers. For example, the Wall Street Journal editorial page last week railed against Trump's tax proposal for offshorers, arguing that politicians shouldn't interfere with companies' business decisions to maximize their profits. When companies make good business decisions, sometimes the pain of laying off American workers is outweighed by the benefits of increasing profits, paying more in taxes and hiring more Americans in other parts of the (growing) business. Additionally, the 35% tax would raise prices for Americans. Even if Trump imposes his promised tariff on foreign goods, the 35% tax could make foreign items more attractive. Others have said Trump is incentivizing other companies to play a game of offshoring chicken. 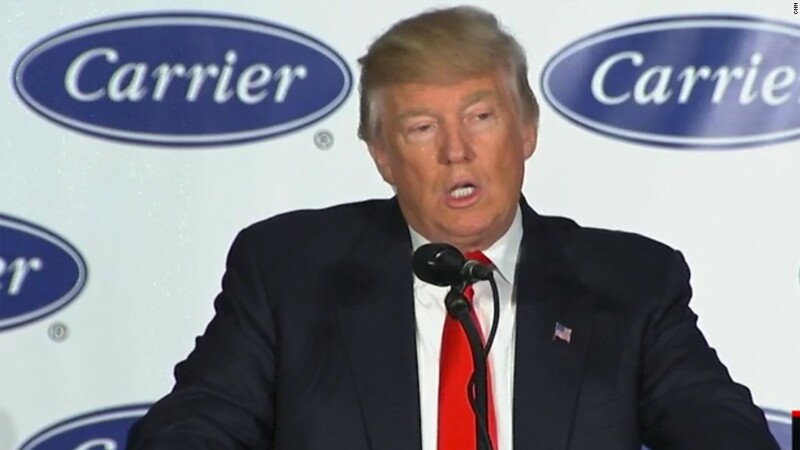 To stay in the United States, Carrier received $7 million in tax breaks. Other businesses looking for similar deals might threaten to ship their jobs overseas too. It's also unclear how such a tax would be enforced. Carrier parent company United Technologies (UTX), for example, went forward with its plans to shift 1,300 jobs to Mexico even as it struck the deal to keep the 800 Indiana factory workers' jobs at home.